We understand that using a new style of knife is always a little difficult, especially when Japanese brands offer much thinner blades than typical Western knives. A complimentary knife chip repair service for all traditional Japanese knives purchased within 45 days at KORIN. A complimentary knife chip repair or sharpening service for all traditional Japanese knives over $1000 within the first year of purchase at KORIN. A complimentary blade straightening service for all traditional Japanese knives purchased through KORIN. Please note that this process is done by hand, and Japanese knives cannot be straighten 100%. 1. Print and fill out the Knife Service Request Form, and attach your receipt/invoice. As a provisional measure, we ask all customers to create an account to record all purchases. Please be aware that we are not responsible for receipt-less or record-less knives. 2. Wrap your knives up very carefully using several sheets of newspaper. We will not be held responsible for damages done during transportation due to poor packaging. Please DO NOT pack knives with the blade unprotected or wrapped in bubble wrap. You may also drop your knife off in person at our New York Showroom with your receipt (same address as the above). 3. 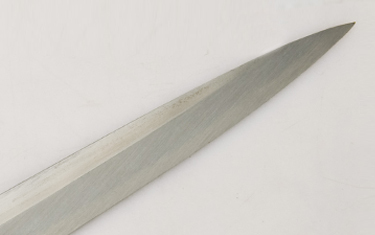 Our staff will contact you once we have received your knives to inform you the shipping fee. We guarantee all knives be returned within 7 days of arrival, not including delivery time. Please be advised that knife sharpening and knife repair are two different services. 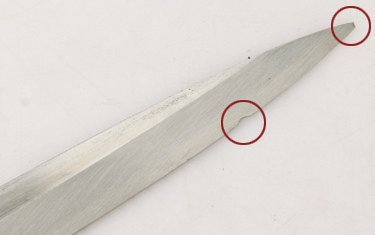 The tools required to repair a blade differs from knife sharpening. 1. Our staff will contact you once we have received your knives to inform you of the service and shipping fee. 2. We ask all customers to kindly provide us with the shipping fee to and from Korin. 3. Once the knives have been sharpened/repaired, we will contact you by phone or e-mail to let you know that they are ready to be shipped back. 4. We will ship back your knives. 5. You will receive an email confirmation with the UPS tracking information. If you have any questions, please feel free to contact us at 1-800-626-2172 (toll free) or 212-587-7021. You may also email us at cs@korin.com.